The Vishwa Hindu Parishad (VHP) today met President A.P.J. Abdul Kalam and demanded a CBI inquiry into the security lapses that led to the terrorist attack at the disputed site in Ayodhya. The police lobbed teargas shells and resorted to lathi-charge to disperse an unruly mob of BJP, VHP and Bajrang Dal activists at the Indore airport today. They were protesting against the arrest of BJP workers, who had led a mob last week to the prohibited area of the airport and prevented a Jet Airways flight from taking off. The Samata Party today appealed to the people to defeat the ‘’anti-people’’ designs of the ruling UPA and the opposition NDA and announced to keep itself away from both during the ensuing Assembly poll in Bihar. India and Pakistan are going to hold senior official-level talks on five different subjects under the composite dialogue process from next week to next month-end. The Supreme Court today vacated the stay on NDA government’s sweeping order for cancelling all oil dealerships since January, 2000, with respect of the 178 cases regarding which the allottees and other parties had not responded to with any objection to a two-judge committee’s recommendations about 414 controversial allotments. Amitabh Arun, an accused in the multi-crore flood relief scam, today surrendered in the special vigilance court here, barely hours after his anticipatory bail plea was rejected by the Patna High Court. After 50 years of counter-insurgency operations, the security forces sit on the fence in Nagaland with no operational role to play. With a view to expanding his base in Maharashtra, expelled Shiv Sena leader Narayan Rane announced here on Sunday that he would join any party which would help resolve the problems of Maharashtra. In the wake of the terrorist attack on the Ayodhya temple, security for the famous Tirumala Balaji temple is under scanner. Indicating that the TRS would sail with the UPA for now, party chief K. Chandrasekhar Rao said that he still believed that Ms Sonia Gandhi would help form a separate state for Telangana. The Mumbai Police today recorded the statement of “encounter specialists” Inspector Pradeep Sharma and Sub-Inspector Daya Nayak in connection with the ongoing probe into the purported conversation between actors Salman Khan and Aishwarya Rai. The Tamil Nadu Government has dropped the idea of constructing a new secretariat complex near the Marina beach in order to protect the livelihood of fisherwomen. The troubled BJP yesterday got advice from unusual quarters. Parliamentary Affairs Minister Ghulam Nabi Azad counselled the Opposition to return to Parliament and target the ruling alliance instead of attacking its own leaders. One person was charred to death in a massive fire that gutted the general compartment of Cheran Express this morning, while over 100 other passengers had a miraculous escape due to alertness of Railway staff. Ruing large-scale use of fake caste certificates to get government jobs, the National Commission for Scheduled Castes (NCSC) today said the practice had reached such proportions that even a member of Parliament got elected to the Lok Sabha on its basis. The Uttar Pradesh Sunni Central Wakf Board, which had declared the Taj Mahal as the property of Wakf, today filed a caveat in the Supreme Court apprehending that the Archaeological Survey of India (ASI), managing the world famous monument, might challenge its order in the apex court. The city has busted a fake marksheet and degree certificate racket with the arrest of five persons from Goregaon in North-West Mumbai. Even as “Mangal Pandey: The Rising” featuring Aamir Khan readies for release next month, the Amar Shaheed Mangal Pandey Memorial Committee here is planning to send a notice to film producer Bobby Bedi. Forest Minister agrees that tiger population in Ranthambore has decreased to 26 from 46. Melody is the key to my success says Lucky Ali. A delegation of sadhus, led by VHP leader Ashok Singhal, also met Union Home Minister Shivraj Patil and submitted a memorandum demanding tighter security at Ayodhya and other important places of worship across the country. “We have met the President and the Home Minister and informed them that terrorists had made their way into the complex from the area adjoining the acquired land, inhabited by minorities,” VHP’s Working President Ashok Singhal told newspersons here after a half-an-hour meeting with Dr Kalam. He said the delegation brought to the notice of the President the security lapses, including the fact that some watch towers were unmanned at the time of the attack. Mr Singhal claimed that the Home Minister, whom the delegation had met earlier had accepted their seven demands and expressed hope that they would be implemented soon. Alleging “laxity” in security at the complex on the day of the attack, the sadhus charged the Mulayam Singh government in Uttar Pradesh with “conspiracy” on the whole issue. “Even after 10 days of the attack, neither Chief Minister Mulayam Singh Yadav nor any of his Cabinet colleagues have visited Ayodhya. This is because of their policy of appeasement,” Jagadguru Ramabhadracharya Maharaj said. He said that lakhs of rupees were spent on security at Ayodhya, but the terrorists were able to enter the complex with lethal arms and carry out an attack near the sanctum sanctorum. Alleging partiality in providing security to Hindu religious places in the country, former MLA Ramvilas Das Vedanti said security personnel manning towers 3 and 5 at the disputed site were absent when the attack took place on July 5. The VHP leaders, claiming that terrorists had entered the Ayodhya complex through the northern side where members of the minority community live in large numbers, demanded that the government should acquire around 100 feet of land on the north side of the temple to ensure security. Contradictions within the BJP surfaced during a debate on the terrorist attack on Ayodhya in the Vidhan Sabha today. Isolated, the BJP walked out in protest after sharp attacks from all parties. Responding to Chief Minister Mulayam Singh Yadav’s detailed statement on the floor of the House presenting the facts of the July 5 terrorist strike on Ayodhya, parties across the spectrum cornered the BJP for attempting to politicise the issue rather than joining ranks to address the menace of terrorism. In his address, the Chief Minister praised the security forces for their alertness in reining in the terrorists and averting a major threat to the peace and communal harmony of the nation in general and Uttar Pradesh in particular. Regretting that terrorist activities being initiated from across the border were refusing to come to an end, Mr Yadav called upon all political parties to sink their differences to tackle the monster of terrorism. Calling the terrorist attack in Ayodhya as a shot to derail the Indo-Pakistan peace process, Mr Yadav said the government on the other hand had been prompt in checking the nefarious designs of the terrorist. Giving a detailed account of the UP police and intelligence agencies’ cracking of the case, he said within days several breakthrough were made resulting in the arrest of two, and identification of two of the five dead terrorist. He also listed his government’s appreciation of the security forces by announcing out of turn promotions to 22 PAC personnel, Rs 25 lakh as reward for the security personnel, Rs 1 lakh each to the three injured CRPF personnel and Rs 50,000 each to the two civilians injured in the encounter with terrorists. 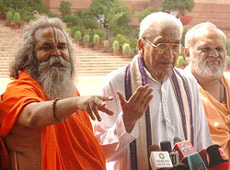 Leader of the Opposition Lalji Tandon, however, called for a commission to enquire into the security lapses in Ayodhya. Charging the government of “appeasement and indulging in vote bank politics” by not taking cognizance of intelligence reports suggesting threat perception to Ayodhya. The terrorist using a Samajwadi party flag on their vehicle to gain entry through the various barricades and reaching their target speaks volumes of the security arrangements at Ayodhya, pointed out Mr Tandon. Over 50 persons were taken into custody. Only two days ago, the state BJP leadership had directed the party workers to refrain from violent agitations and maintain decorum at all places. According to police sources, nearly 200 persons reached the airport this morning and squatted on the road leading to the airport. Having failed to persuade them to clear the road, the police arrested them. This was a signal for the slogan shouting Sangh activists, who resorted to vandalism. They were said to have stoned and damaged nearly 24 vehicles including some belonging to the security forces. The police first burst teargas shells. As it did not have the desired effect, they lathi-charged the demonstrators. Talking to mediapersons here Samata Party President Brahmanand Mandal called upon the people to strive for drawing a map which could serve the interests of the common man, who had remained neglected so far. Stressing the need for an alternative third front, he said his party was making sincere efforts in this regard. On the ensuing Bihar poll, he said the party would strive for polarisation of the like-minded demoratic and secular forces in the state for re-emergence of a viable third front and an alternative political force in Bihar. ‘’Bihar has been ruined by unabated criminalisation of politics and impregnation of the caste and communal virus in the state’s social fabric by both, the BJP-led NDA and Lalu’s RJD,’’ he said. He was hopeful the Left would come forward to reshape Bihar and rewrite its political history. The Lok Janshakti Party (LJP) will fight for the installation of a non-RJD secular government in Bihar, said party President and Union Steel Minister Ram Vilas Paswan here today. Addressing reporters at his residence, Mr Paswan said his party would have no truck with either the RJD or the BJP-led NDA and that it would strive to ensure that the next government in the state was led by a ‘Muslim’ Chief Minister. ‘’We are in touch with all secular and democratic forces for a viable alliance in the coming Bihar poll,’’ Mr Paswan said. ‘’I am meeting senior Congress leader Digvijay Singh, in charge of Bihar, on July 21 and the CPI’s A B Bardhan on July 22 to chalk out a secular strategy,’’ he added. PTI adds: Meanwhile, the CPM today advised Mr Ramvilas Paswan’s LJP to quit the UPA if it was not prepared to fight the coming Bihar Assembly election with its coalition partners against the NDA. “If the LJP is not prepared to fight alongside other UPA partners against the NDA in the Assembly elections, it should come out of the UPA and lend its issue-based support from outside. There is no point in remaining in the UPA and fighting the poll against its constituents,” CPM politburo member Sitaram Yechuri told reporters. Promotion of friendly exchanges in various fields — July 26-27, 2005 (Secretary (Culture) level in Islamabad). Nuclear Confidence-Building Measures (CBMs) — August 5-6, 2005 (Additional Secretary (UN) level in New Delhi). Conventional CBMs —August 8, 2005 (Joint Secretary (Pakistan-Afghanistan-Iran) level in New Delhi). Economic and Commercial Cooperation and Joint Study Group Meeting — August 9-10 2005 (Commerce Secretary level in New Delhi). Terrorism and Drug Trafficking — August 29-30, 2005 (Home Secretary level in New Delhi). A Bench of Mr Justice Y K Sabharwal, Mr Justice D M Dharmadhikari and Mr Justice B.N. Srikrishna directed the oil companies concerned to take further action as per the recommendations of the committee with respect of the 178 allotments, regarding which no objection to the panel’s report wee filed by the parties. Of the 178 allotments, the committee had approved 97 of them and ordered cancellation of 81. It would mean that the oil companies were free to allow operation of the 97 allotments and order cancellation of the 81 as recommended by the panel. The committee in all had approved 108 allotments out of 414, disapproved 301 and did not consider five cases as per a chart presented before the court today by amicus curiea Gopal Subramaniam. The chart showed that objections were filed with respect of the 248 non-approved and 11 approved cases in the court by the parties concerned. The court adjourned hearing on the objection applications for six weeks with the direction that oil companies were free to take action as per the committee report in 178 cases of both approved and non-approved categories. The NDA government in 2003 had cancelled nearly 3,000 allotments made during its regime after allegations of making them in favour of NDA sympathisers. But the apex court had stayed the cancellation order following various high courts in the country were flooded with petitions by allottees challenging cancellations by a sweeping order. The Supreme Court had set up a probe committee under retired judges P K Bahari and S C Agrawal, which scrutinised the allotments and zeroed on 414 cases for thorough examination which looked “tainted” on the face of it. However, the committee finally had disapproved 301 allotments of the 414 cases as per the chart presented in the court today. Arun gave himself up before the designated vigilance judge Jitendra Mohan Sharma, who remanded him to judicial custody till August 1. Additional Director General (Vigilance Bureau) Neelmani said Arun, a computer programmer with the Patna District Rural Development Authority, was a key player in the scam as he was privy to the illegal transactions made by the suspended former Patna district magistrate Gautam Goswami. Arun was posted in the office of the district magistrate and was considered very close to both Goswami and Santosh Jha, the alleged kingpin of the scam and a supplier of relief materials. Both Goswami and Jha are in jail. Neelmani said the Vigilance Bureau, which is probing the scam, would seek Arun’s remand for custodial interrogation. The guns are silent for the first time since 1956, when the Army was inducted to crush the Naga secessionist movement. The ceasefire with the NSCN (IM) has given the jawans ample opportunity to rebuild bridges, burnt during five decades of hostilities, through a civic action programme. According to police records, almost 2,000 persons, including 1,000 militants, have died in the past 15 years in Nagaland. About 600 civilians have been killed in insurgency related incidents, while about 250 security personnel haven fallen to militants’ bullets. Most of the Naga people, however, refuse to forget the scars of the war. “Many seem to have forgiven the men in uniform, but not those who have lost their near and dear ones”, Hokhito, a young Naga said. An Army official said the security forces could not have found a better time to rebuild confidence among the people. From fast track recruitment rallies to providing civic amenities, the forces are doing everything to win the hearts of the people. The signs of this new-found friendliness are visible in the state. The numerous checkpoints, once synonymous with Nagaland, are gone and troops no longer patrol the streets. On the streets of Kohima, huge hoardings beckon young Nagas to join the country’s defence forces. The Air force recently held a fast track recruitment drive in the state capital and handed over on the spot call letters for the interview at the service selection board. “The response from the Naga youth has been overwhelming”, an Army spokesman said. The Assam Rifles, too, has joined the fray. The country’s oldest paramilitary force has been holding motivational programmes like career counselling, coaching for the entrance tests of the National Defence Academy and the Combined Defence Services examinations. It has also proposed to set up rehabilitation centres at various places in the state for drug abusers. A senior official in the administration admitted a change in the attitude of the young Naga boys and girls who are more interested in building their careers than being involved in insurgency related activities. They are more inclined to join the mainstream which has brightened the prospect of permanent peace in the area, sooner or later”, the official added. Mr Rane told reporters that he had been talking to both the Congress and the Nationalist Congress Party on this. “I will go with the party which provides justice to Maharashtra,” Mr Rane said. Despite failing to capture the Shiv Sena Legislature Party in Maharashtra, Mr Rane remained defiant and said he continued to enjoy the support of 10 MLAs from the Shiv Sena. To prevent them being lured back into the ranks of the Shiv Sena, Mr Rane has hosted them at a hotel in South Mumbai. The party needs the MLAs to hold on to the post of the Leader of the Opposition. Should all 10 MLAs leave with Mr Rane, the Shiv Sena will have just 52 MLAs or two legislators less than its ally, the Bharatiya Janata Party and would have to give up claims for the post. Though Shiv Sena MLA Ramdas Kadam has replaced Mr Rane as leader of the Shiv Sena, he has not been appointed Leader of the Opposition. Sources say the BJP is keen on bagging the post of Leader of the Opposition as part of its strategy to expand its base in Maharashtra at the cost of the Shiv Sena. The Andhra Pradesh Government is planning to beef up security at the temple with a host of measures, besides contemplating to hand over the temple security to the Central Industrial Security Force (CISF), a specialised paramilitary force raised to guard vital installations in the country. “We will soon make a request to CISF authorities to take over the security,” the Inspector-General of Police (Rayalaseema range) N. Sambasiva Rao said after a meeting of the police top brass here to review the security set-up at Tirumala, the abode of Lord Venkateshwara. It is proposed to set up bulletproof doors, each costing Rs 40 lakh, at two or three places inside the temple and bulletproof cabins for security personnel. The meeting, chaired by Director-General of Police Swaranjit Sen last evening also decided to intensify the combing operations around Seshachalam and Palakonda forests on the Tirumala hills and to expand the intelligence network. The Lord of the Seven Hills attracts an average of 50,000 pilgrims daily and the shrine is known to be the richest in the country with revenues in excess of Rs 800 crore. Modern gadgets would be deployed to check the baggage of pilgrims while sophisticated jammers would be put in place to block the signals of mobile phones and other electronic equipment within the temple premises and also up to a radius of 100 metres from the main entrance. A foolproof security ring would be thrown around the temple with additional security forces and modern gadgets. “We will prepare a contingency plan within the next two months to strengthen overall security at the temple,” the IGP said. After the terrorist strike at Ayodhya, a team of senior police officials, led by the DGP, had visited the temple on July 3 to review the security arrangements. At present, over 1,200 personnel of the Special Protection Force (SPF), Civil Armed Reserve (AR), security guards of Tirumala Tirupati Devasthanams (TTD) and private security guards are involved in the security of the temple. Mr Rao said the idea was to reduce the number of agencies and fix the responsibility. The TTD, the autonomous body managing the temple affairs, would bear the cost of additional security measures. Addressing a huge gathering at Warangal, the heart of Telangana, for the first time after TRS ministers resigned from the state government, Mr Rao pointed out that it was on Ms Gandhi’s insistence that the TRS joined the UPA government on the promise that she would deliver Telangana. The TRS President, however, targeted Chief Minister Y. S. Rajasekhara Reddy, charging him with insensitivity over the underdeveloped region. Mr Reddy was bent on continuing the injustice to Telangana by taking up irrigation projects that would deny the rights of the region over the Krishna and Godavari waters, he alleged. Nationalist Congress Party leader and Union Minister for Agriculture Sharad Pawar, who was the chief guest, declared that that day was not far off when Telangana would have its own state. If Punjab and Haryana could be formed, if Chattishgarh could separate from Madhya Pradesh, Telangana could also realise its dream of a separate state, he told the well-attended public meeting. The gathering is a show of strength by the TRS, which is now getting ready to step up its campaign after it severed ties with the Congress government in the state. Mr Sharma and Mr Nayak have been posted in the crime branch since many years and Mr Sharma heads one of suburban crime branch units that had an electronic surveillance system attached to it. Crime branch sources said the statements of the two officers were recorded to find out if they were aware whether the actor was under surveillance in 2001, when the conversation between Salman and Aishwarya was alleged to have taken place. Mr Sharma was also part of the team that probed the alleged underworld links of film financier Bharat Shah and the investigators asked the Inspector if the present conversation in controversy had originated then, the sources said. Mr Sharma and Mr Nayak’s statements came a day after the police recorded the statement of former crime branch DCP Pradip Sawant on the issue. Mr Sawant, who has been booked under the MCOCA in the Telgi fake stamps scam, was the second seniormost official of the crime branch from 1999 to 2004. Crime branch officials on the condition of anonymity said while the forensic report of the voice samples of the two stars was awaited, investigators were trying to find out if there was leakage of information in the form of the tape from any of the crime branch men. The Mumbai Crime Branch had last year centralised its electronic surveillance systems apparently to avoid misuse the phone tapping system by some of its personnel, the sources said. According to the sources, the decision to centralise the system has been vindicated since the probe into the Salman Khan-Aishwarya Rai audio-tape case hints that the tapped telephonic conversations available with the crime branch are susceptible to leaks. The phone tapping equipment which were independently monitored by various crime branch units in the suburbs are now brought under one roof and responsibility fixed on individuals for the surveillance and its protection against misuse, police sources said. Responding to the concern expressed by the National Human Rights Commission (NHRC) about protecting the interests of the Chennai Marina coastal women, the Tamil Nadu Government has informed that it has dropped its plans of constructing the complex near the beach. The state government has said it will construct the complex at another location in Chennai. The National Commission for Women (NCW) referred the matter to the NHRC after holding a public hearing with Marina coastal fishermen and other unorganised workers in May 2003. In its report, the NCW referred to the government’s plan to convert Marina to house foreign embassies, five star hotels and to move the secretariat to Marina. The report further warned that the government’s plan would affect one lakh persons and lead to large-scale eviction and deny livelihood to fishermen and unorganised women labourers. 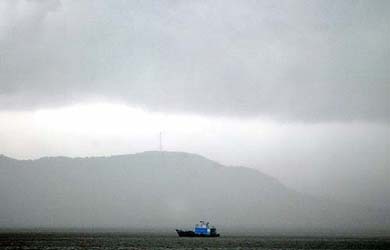 The NCW pointed out that the construction would also violate the Coastal Regulation Zone (CRZ). The jurors at the public meeting recommended several measures for adoption by the Central and state government to safeguard the interests of the coastal women. The report of the public hearing was sent to the NHRC. Taking cognisance of the matter, the commission directed in May 2004 that the recommendations of the jury at the public hearing be sent to the concerned authorities for their comments. The matter was referred to the Chief Secretary, Tamil Nadu Government and the Secretaries in the Departments of Ocean Development and Urban Development, respectively. In its reply last June, the Department of Ocean Development said the proposal pertained to the Ministry of Environment and Forests. The NHRC asked the Ministry of Environment and Forests to send its comments. The Ministry of Urban Development informed the commission that it had no comments to offer. “They say an idle mind is the devil’s workshop,” he remarked, stating that this was best applied to the BJP these days, which had boycotted the last Parliament session. Restive party cadres, denied a forum to vent their grievances, had instead turned their ire on their own leaders, Mr Azad maintained. Volunteering to be the Opposition’s punching bag, Mr Azad said the government usually acted as a buffer but with the BJP deciding to stay away from Parliament, it removed that buffer and ended up inviting trouble for its leaders. “ I appeal to the BJP to end its boycott or else its internal crisis will only get worse...attack us, not your own leaders,” Mr Azad said. Speaking to reporters about the coming monsoon session,the minister said he had not been in touch with the BJP but was confident it would heed his advice as they had realised the folly of staying away from Parliament. “If they return, it will be good for us, for Parliamentary democracy and, more important, it will be good for the BJP’s own health,” he said while assuring the opposition that the government would not shy away from debating any issue which it wished to raise. While Mr Azad was only too willing to have a dig at the Opposition, he was far more understanding when questioned about the belligerent stand adopted by the Left parties, emphasising that the UPA was working in close coordination with them. The Left, he explained, was lending outside support to the UPA but,at the same time, they had said they would not stop pursuing their own issues. “This does not mean they will oppose the government,” he said, adding that they always said they would support the UPA government for five years. He said they had convened a meeting of chief whips and deputy leaders of all parties on Wednesday to ensure smooth functioning during the session. The meeting is to be presided over by Defence Minister Pranab Mukherjee, who is also the leader of the Lok Sabha. Giving details about the session, which opens on July 25, Mr Azad said it would be devoted primarily to essential government legislative business which included the passage of the all-important National Rural Employment Guarantee Bill, which seeks to provide 100 days’ employment every year to poor families. Mr Azad, who met the secretaries of all ministries on Monday to finalise the government’s legislative business, said a total of 10 Bills had so far been cleared for passage. The pending legislation on the revival of the Andhra Pradesh Legislative Council, which was scrapped by the TDP in the eighties, is to be passed, providing an opportunity to the Congress to accommodate some of its dissident functionaries. In addition, Parliament will also take up the Payment of Wages Amendment Bill which enhances the wage ceiling and strengthens penal provisions. The ordinance, expanding the list of Indians entitled to dual citizenship, will be made into a law. The general compartment of train, which was coming from Chennai to the city, was totally gutted and the break van next to it was partially burnt in the blaze near Irugar about 15 km from here, Railway sources told PTI. The guard in the break van noticed heavy smoke emanating from the toilet and alerted the driver who immediately stopped the train, just before Irugur railway station, at 5.40 AM. Both the driver and guard managed to detach the compartment and the break van before the fire spread and nearly 100 passengers rushed to safety, the sources said. The charred body of a person was recovered from the toilet of the compartment, the sources said quoting initial reports. The cause of the fire was not known immediately, the sources said. The caveat, which makes it binding on the court to hear the party filing it at a time when a petition was moved by the other side, was filed by the Wakf Board through its counsel Anis Suhrawardy in the apex court registry. But the ASI has so far not moved the court. The board, while deciding a petition moved before it by a person challenging the control of the monument by the ASI, in its order on July 13 had said the Taj Mahal and the mosque adjacent to it were the Wakf properties. However, the board had deferred pronouncement of the order relating to the management of theses properties. The ASI had stated that it would challenge the verdict in the court, preferably in the Supreme Court, which is seized of various petitions relating to the monument, including the ill effect of environment pollution on it and the controversial Taj Corridor project, in which former U P Chief Minister Mayawati is one of the eight accused. Alleging that an MP from Bijnor in Uttar Pradesh had got elected to the Lok Sabha in the last General Election on the basis of a fake certificate, NCSC Chairman Suraj Bhan, while addressing mediapersons here, said the government had been notified of the matter. “Mr Munshi Ram Pal, a sitting MP from Bijnor, got himself elected from a reserved constituency in the last Parliamentary elections despite him not belonging to the Scheduled Caste,” Mr Bhan added. Interestingly, he gave two affidavits in 2002, when he wanted to sell his land, that he was not an SC. Later, during the Lok Sabha elections, Mr Pal, an OBC (Garadia), gave another affidavit stating that he was a member of a Scheduled Caste and hence fought from a reserved constituency, said Mr Bhan. “Surprisingly, all certificates were authenticated by the same tehsildar,” he pointed out. Senior Police Inspector Ashok Ingole told newspersons here today that on specific information, they arrested Rafiq Mehmood Merchant (25) and seized fake certificates on Sunday. Committee secretary O.P. Tiwari said today that although Mangal Pandey was born at Nagwan here, not even a single scene of the film was canned in his native village. “We are planning to send a court notice to Bedi in this regard,” he claimed. Yesterday, several stage artistes here held a protest march against the film and its producer to highlight this fact.